It is a traditional each year, that at camp, we exchange gifts. (You can see my previous year makes here – 2017, 2015, 2014, 2012.1 2012.2 2012.3 2012.4 – 2016 & 2011 remain unblogged). This tradition started with our very first quilt camp, which was a hosted retreat at the end of November, the organiser suggested as the dinner was a Christmas theme, that we may wish to exchange gifts. What was a secret santa, has become an annual tradition that I love. It’s so much fun stalking social media and gather answers and reading between the lines and taking a fair guess, to be honest, to create something each person will enjoy. The first gift from this year that I wanted to share, was the gift I made for Bec. It was one of the easiest to decide – in her answers to our normal questionnaire, she mentioned she loved chocolate but had to hide it from the other people in her house, lest they steal it. Straight away, the idea of a hollow book jumped out at me. I picked up this hardcover book of Australian poetry at the op shop for $3 (bargain!). My criteria were – must be hard cover, must be something incredibly boring from a 12 year olds perspective to avoid sticky beaking sons from taking a look inside, must be in great nick. The dust jacket was a but ratty, but underneath, the actual binding was in excellent condition. Of course, taking more than 10 seconds while surrounded by books was too much temptation for the three children I had with me, and the $3 buy ballooned to a bank-breaking $6 by the time they added their finds (what can I say? We They are suckers for books. Get it from their father, I think). The actual making process was reasonably straight forwrd. I decided on what I wanted the first page to be, and turned it forward with the cover & end papers, and then held the remaining pages in place with my hand and mod-podged the outside edges. I popped a spacer between the glued pages and the cover & loose pages, and then popped another, heavy book on top to hold the pages firm as the glue dried. Once dry, I opened the book up again, and used a ruler and lead pencil to mark out the space I wanted to hollow out. I couldn’t find my X-Acto knife, so instead had to borrow Bear’s stanley knife, which made it difficult to get a neat perpendicular cut. In an ideal world, I would have liked to have gone a bit deeper, but the edges were starting to angle in, and I hit a page that mentioned both “camp” and “quilt” so I figured that was a sign and called it close enough. With a spot of tidying up done, I got the modpodge out again and sealed the insides, and also covered the top page with the glue as well, before fully closing the book (no spacers this time). When it dried, I was able to open it up with just the one uncut page glued to the hollow, which I could then easily trim open to tidy up the top of my work. I’m thinking I might hit the oppy again soon and make up a bunch of these for my kids and also our nieces are of an age to appreciate them… it could also be a fun way to send a gift card for our adult nephew! I might need one of my own to keep the list of grand ideas of things to make before Christmas…. 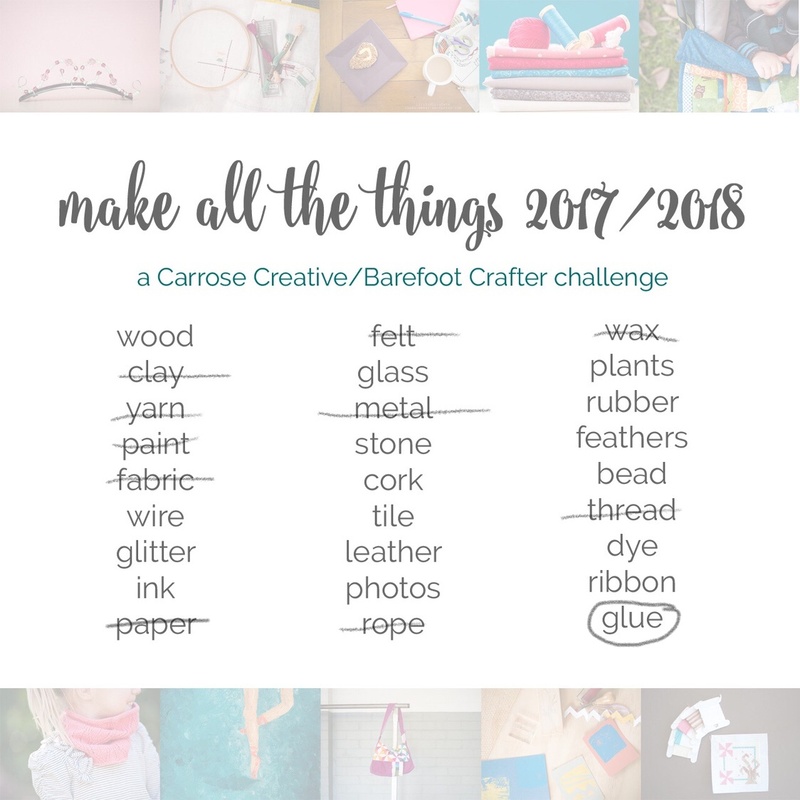 This is project eleven of 26 for the Make All The Things Challenge I am doing with Carrose Creative. You can see my other finished projects here.